The Palace-on-Wheels arrives in Sawai Madhopur, a city named after its founder Maharaja Sawai Madho Singh I. After breakfast a visit is arranged to the Ranthambhor National Park,wherein are located the ruins of a 10th century fort. This wildlife sanctuary is considered to be the country’s best for observing and photographing the activities of the tiger. The park, covering an area of 392 sq. kms. is home to more than 300 species of birds. The tiger, hyena, rate, jackal and fox are among those constituting the carnivorous population here.Upon return to the Palace-on-Wheels, you leave for Chittorgarh, when one gets an opportunity to watch the colourful countryside passing by in the daylight.After lunch on board you are in Chittorgarh. Images of love and velour; scars of battles lost and won…thrice-besieged, Chittorgarh Fort is all this and more Moving legends of honor and pride will echo in your mind as you proceed to Udaipur. Udaipur, the Lake City, was founded by Maharana Udai Singh of Mewar,Perhaps the two most beautiful sites of Udaipur are the dream-like marble palaces- the Jag Niwas and the Jag Mandir, which appear to rise from the blue waters of Lake Pichhola. After lunch at a Five Star Hotel, a visit to the City Palace. Next morning the Palace-on-Wheels is in Jodhpur, a city ringed by a high stone wall with seven gates and several bastions. This second largest city of Rajasthan, is known for its rock-solid Mehrangarh Fort. The grand palaces within -Moti Mahal, Sheesh Mahal, Phool Mahal, Sileh Khana and Daulat Khana are impressive examples of architectural excellence. 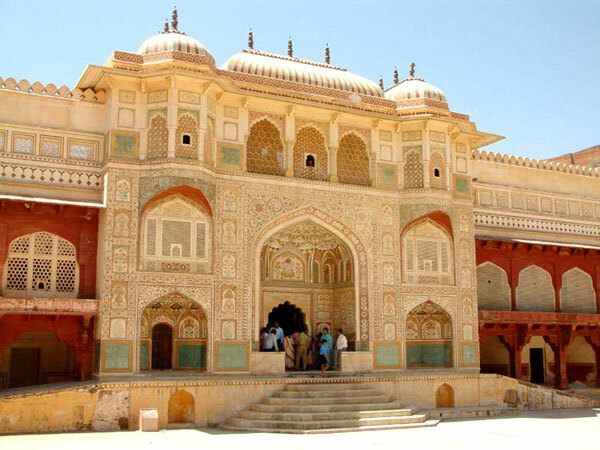 Near the fort complex lies Jaswant Thada, and a group of royal cenotaphs made of white marble. After lunch at a Palace hotel, return to the Palace-on-Wheels. While in Jodhpur shop for exquisite handicraft articles including the famous breeches, embroidered shoes, metal curios, silverware,paintings and tie and dye fabrics. In the morning, the Palace on Wheels arrives in Bharatpur, the capital of Maharaja Suraj Mal .After breakfast pay a visit to the world famous bird sanctuary, Keoladeo Ghana National Park, the nesting place for thousands of Egrets, Siberian Cranes, migratory Water Fowl and other species of birds.Upon arrival visit the Agra Fort and after lunch arrive at the Taj Mahal, one of the seven wonders of the world.Agra is known for its splendid marble inlay work like the Pietra Dura work on the Taj, leather goods and jewellery. If you have not decided yet or wants to customize tour itinerary or hotels listed above in "Palace on Wheels -Luxury Train Tour Package From idiscoverindia", then we can change the travel itinerary and make a personalized, tailor-made holiday package, especially for you. We can modify this travel package as per your itinerary, budget, duration and the tourist places you would like to visit, including transportation and airfare should be included or not. Please fill the form below to contact us.